KE00001 is a solid phase sandwich Enzyme Linked-Immuno-Sorbent Assay (Sandwich ELISA). 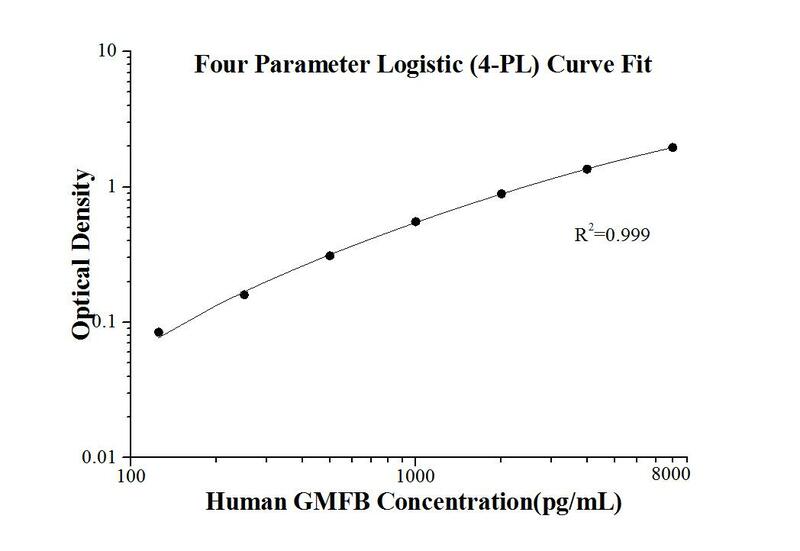 The GMFB ELISA kit is to be used to detect and quantify protein levels of endogenous GMFB. The assay recognizes human GMFB. A monoclonal antibody specific for GMFB has been pre-coated onto the microwells. The GMFB protein in samples is captured by the coated antibody after incubation. Following extensive washing, a polyclonal antibody specific for GMFB is added to detect the captured GMFB protein. For signal development, horseradish peroxidase (HRP)-conjugated antibody is added, followed by Tetramethyl-benzidine (TMB) reagent. Solution containing sulfuric acid is used to stop color development and the color intensity which is proportional to the quantity of bound protein is measurable at 450nm with the correction wavelength set at 630 nm. GMFB, Glia maturation factor beta, is a 17kd protein which initially identified as a nerve growth factor implicated in nervous system development. GMF-beta protein is specific to the brain where it is expressed in glial cells (mainly astrocytes) and insome neurons. GMFB causes differentiation of brain cells, stimulation of neural regeneration, and inhibition of proliferation of tumor cells. GMFB can be considered as a prognostic predictor for SOC(Serous ovarian carcinoma) patients. This kit is used to quantify GMFB level in vivo.